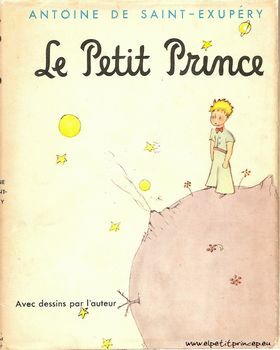 One of the books I cherish and often carry with me is Antoine de Saint-Exupéry's The Little Prince (in the original French Le Petit Prince). Although usually categorized as children's literature, I believe the themes of loneliness and loss, love and friendship, the magic of imagination and the search for meaning are relevant to a person of any age. I often find myself returning to the book, reading passages again and again to remind myself of what is important in life. The story begins with the reminiscences of a pilot who has befriended a wonderful little prince when his airplane crashed in the Sahara Desert six years ago. The pilot notes that before his encounter with the prince he had become a "grown-up," that is to say he shunned the more creative, unique aspects of himself in order to fit into society and become an adult. however, this changes when the little prince comes into his life. Over the course of a few days, the pilot comes to learn more and more about the little prince. the flower is the love of his life but because of his youth and her vanity, he misunderstands her and decides to leave his home to explore, learn and find friends. On his journey he encounters various grown ups each residing on his own planet and each very strange in his own way but none suitable to really be friends with. He finally arrives on the planet Earth but lands in the desert where he encounters a snake and continues his search for a friend. Eventually he meets some flowers and a fox but initially no people. However, it is from the fox that little prince learns about friendship and what makes his relationship with his flower important and special. 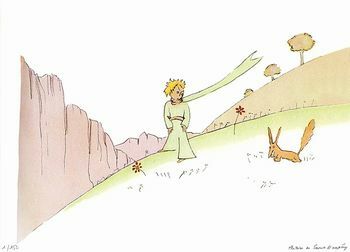 The little prince, having become friends with the fox and learning what really matters, sets forth to find more friends. Having spent some time among people, he returns to the desert for the anniversary of his arrival on Earth and there he encounters the pilot. The encounter is life-changing for the pilot. 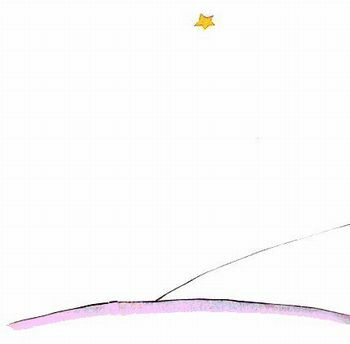 The story is accompanied with illustrations drawn and painted by Saint-Exupéry himself, and their simplicity in design and presentation reflect well the sentiments of the text. Although it may be argued that the grown-up vs child dichotomy that pervades the narrative is overly simplistic (for childhood is not without its own vices, adulthood not without its own virtues), the overall question asked "What truly matters?" and the "answers" (or perhaps, more appropriately, secrets) provided justify such a simplification, since these are subjects worthy of personal contemplation and reflection at any age. And so, I cannot recommend this story highly enough to both those who have never read the book and to those that have. For this is a story for anyone who has ever felt lonely or misunderstood, for anyone who has wondered what makes someone or something special, for those who are still in a sense "looking" for a friend. for the next time you look up at the night sky, you may be surprised by what you might find.